Then buy a souvenir and don it. That has a starving pauper on it. 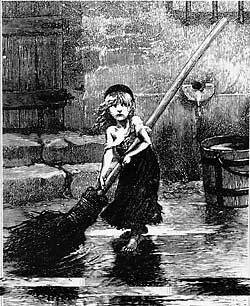 That pauper, from the millions of t-shirts, CDs and other items sold around the heyday of Les Misérables, comes from an illustration in Victor Hugo’s original novel depicting the character Cosette. The girl in the story lives with the Thénardiers – a corrupt innkeeper and his wife – while her mother works in the city. The couple severely abuses and under-nourishes Cosette and forces her to labor in the inn, even while spoiling their own child (2 children in the novel). In the musical version, Cosette receives her freedom when Valjean buys her from the Thénardiers for 1500 francs – a price that confirms the suspicion that she is not a boarder at all but a slave. Valjean then gives her a doll, to her delight. In possibly the closest modern example of Cosette’s story, today countless couples adopt children in order to abuse them or force them to work as slaves. While the act of taking the child in appears charitable, the motive is anything but. The question becomes, how much will today’s Thénardiers demand in order to release the children they’ve enslaved? Will 1500 francs do? The average slave today costs approximately $340 worldwide. Or would life in prison be enough to convince them that the world no longer accepts their corruption? And what will it take to heal a child’s heart after years of trauma from their adoptive “parents”? The children in Victor Hugo’s day were much stronger than we are if the author truly thought it would only take a doll for Cosette to move on. No. Life in prison is not acceptable for the people you describe. $50,000 per year for working people to warehouse these criminals for the rest of their lives is not the right answer. the entire world, after introducing it largely within the United states and U.K.
however, individuals call for a connect-in installment).